Little that’s gone on lately has been ordinary, especially in other parts of the world. I’ve watched a few videos, scanned the headlines and saw a few photos, but for the most part, I’ve stayed far, far away from immersing myself in the news coverage of what’s gone on in Japan. I’m not posting on Facebook about it; I don’t tweet, or retweet about it. And quite frankly, if you want to call me insensitive, go ahead. That’s your right. Just remember that it’s my right too, to decide how I deal with it. And this is how I manage it, because the last time I was soaked in a tragedy, it ended up being stuck with me for the rest of my life. Back when the world seemed a lot less harsh, I woke on a gorgeous September morning in Las Vegas, ready to spend my day at an International Baking Convention. I was the office manager for a large wholesale bakery in the Cities, and was there to check out new equipment, new software, and new procedures, and I never got the chance. Because that morning was the 11th, in 2001. And we all know what happened then. I watched the entire horror play out on television, right in front of me. I watched bodies plummet through the sky; I watched people on the streets, staring in terror. I watched those towers fall and I cried my eyes out. The country fell apart before my eyes, and I was stranded thousands of miles from home. Everywhere I went for the next six days until I returned home, it was like the tragedy was embedded in my skin, my ears, my eyes. It was all everyone talked about. It was on every television, in every podunk spot that the car stopped as I made my way home, across the gorgeous country amidst the worst times in recent memory. Yes, my boss and I drove home from Nevada; it took 2-1/2 days. We drove through the mountains of the West, through Utah and Colorado and were surrounded by stunning vistas while the sorrow poured out of the radio. A pall had settled on the nation and every gas station, every coffee shop, every tiny diner along the way were full of grim faces and tears. It’s been 10 years since that all happened and I still can see every detail; I can still feel my stomach sinking in agony, like it did that morning while I watched, unable to tear my eyes away. If I catch a glimpse of the clock, and it happens to read 9:11, I can’t get away from the image it leaves with me. And I can’t fill my head, again, with such sorrow. I’m a sponge; I absorb my surroundings and it gets under my skin to stay with me. And it isn’t just events. It’s people, it’s daily situations, it’s the crabby strangers in passing, the nasty drivers on the road. Negativity can easily fill me up and just as easily take me down. I need to protect myself from drowning in it and so I simply turn away. It’s isn’t that I don’t care. The problem is that I care too much and me, this tiny individual, can’t offer much more than a solitary prayer of compassion. My repetitive tweets won’t do anyone any good; yet another posting on yet another heart-wrenching video won’t do anything. There are plenty of people to spread the news, and I just turn and walk away because to do otherwise would be more images seared in my brain that will stick with me forever. I can’t do that to myself. It’s bad enough that in the darkness I sometimes still see a burning skyscraper, and bodies falling through the smoke. After 10 years you’d think they would fade, but they haven’t. Even the few images of the destruction in Japan won’t replace the shocking pictures of that gorgeous September morning. In fact, they’ve joined them. And that’s not something I need. Because I needed to feel ordinary and plain, to have something of a constant come up during a time that is now written indelibly in the history books. And for me, it was Pancakes. 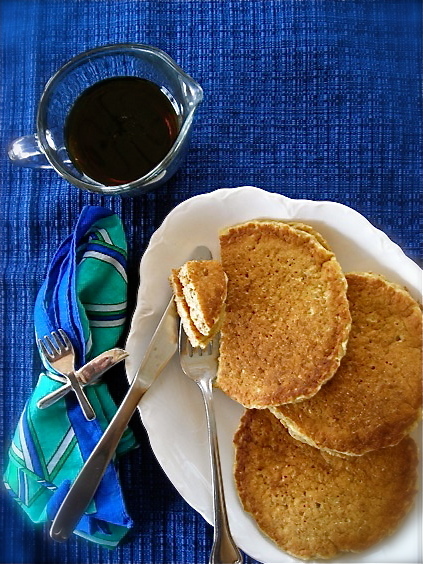 And not just any Pancakes; these were Wheat Crumb Pancakes, made with fresh bread crumbs as the base. It was odd, to say the least, and maybe not exactly what I would reach for to try and raise some ordinary sense to my day, but it worked. Strangely enough. The recipe came from Marion Cunningham’s The Breakfast Book. I picked this book up at a used book store many years ago, and it languished in my cookbook cupboard for a long time. I glanced at it once or twice, but never really absorbed it, and last year in a book purge, I almost added it to the boxes I was giving away. But something made me leave it on the shelf and I’m so glad I did because what exists in those pages is a treasure trove of simple, hearty, wholesome and flavorful breakfast recipes, and everyone I’ve tried has been delicious. 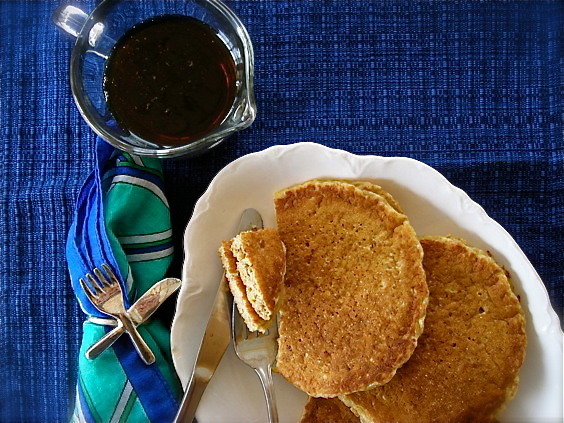 These Wheat Crumb Pancakes were amazing; fluffy and light and so flavorful. I added some texture to them by tossing finely chopped honey-roasted peanuts into the batter, and replacing some of the liquid with pureed mango and peaches. They cook up thick and hearty, and beg for a dousing of maple syrup. A plate of them set my emotions and grounded me, just as I had hoped they would. Place bread crumbs in a large bowl. Heat milk and butter in small saucepan until butter is melted and milk is hot. Pour over bread crumbs and let stand for 5-10 minutes, stirring to fully combine. Add flour, eggs, baking powder and salt to bread crumb mix. Fold together until just mixed and let stand for a few minutes. 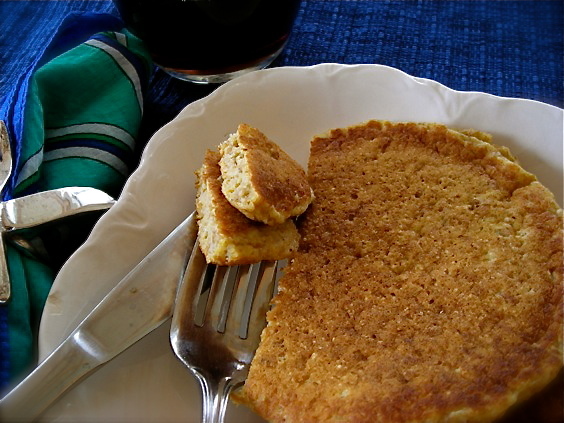 Cook pancakes on stovetop, or an electric skillet. Top with maple syrup and butter, if desired, or toppings of choice. NOTE: Fresh bread crumbs can be made from several slices of good quality whole wheat bread. Place them in a food processor and process until they’re the size of peas. Do not sub in dried bread crumbs, croutons or Panko. I like to keep a ziploc bag of fresh breads crumbs in the freezer. Any leftover bread gets processed and added to the bag. The crumbs are wonderful to have on hand for many uses in the kitchen. I know just how you feel about being a “sponge.” For me, images of any kind of drama are seemingly embedded in my thought, so I too, have learned to be extremely careful of what I “let in.” Even at the movies, which my rational self knows are fiction, some are just too graphic, too horrific, and I can’t shake them. So I don’t do slasher/horror/explicit films of any kind. We can be aware of the issues, we can still offer our prayers and aid–without getting mesmerized by the images (I think more folks should follow us!) I honestly think it is the wisest way to go. Thanks for writing this. It’s how I feel too. But I hate that I feel guilty for feeling this way. I want to just live my little life, with my little family and not think about such horrors, because like you say, it’s just too easy to let it takeover. But then I feel like I’m being insensitive or ignorant for choosing not to dwell. So, it’s nice to hear someone else feels similar to me. I’m with you, Kate. Each day when I look at the news websites I feel like crying about what’s happening in Japan. We all find our own ways to cope.